The Rochester Business Journal is taking another exciting step forward in its digital transformation today: We are now a digital-first operation. The weekly print publication will continue to be packed with robust local business news, as it has been for the past 30 years. Now, however, those of you who prefer to get your news online will not have to wait until after a story has appeared in print before you can read it online. We will post breaking news as it happens and then update as we do more reporting. We will post our in-depth feature stories, enterprise stories, trend stories, special report stories and more as soon as they are ready, rather than waiting until after they have already appeared in print. Because of this change, we are locking our exclusive content so that you can only read it if you are a subscriber. Your print subscription includes a digital subscription, so you will have access to all of our content. 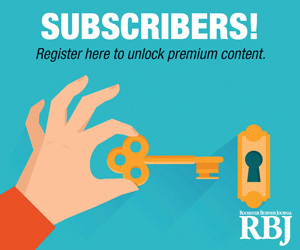 You just need to register your account by setting up a username and password at www.rbj.net. Some of our content—including special section stories, award announcements, new hires and promotions, and other stories as determined by our editors—will continue to be free to all readers online. But most of our content will be exclusive to subscribers. We launched our new website in March to give us the ability to showcase all of the excellent content we have to offer in a way that is easy for readers to access. Now we are prepared to make even better use of our online tools and allow you to read our content when you want it and on whatever platform you prefer. In preparation for this endeavor, we recently revamped our coverage strategies and beats and will be expanding the number of topics we focus on. We are excited to be able to offer you even more local business news so that you can stay up to date on what is happening in your community. This has been an exciting year of transformation for the Rochester Business Journal, but we are committed to continuing to do what we have always done: provide you essential business news coverage. These changes allow us to not only meet your needs for what content we offer, but also for when and where we offer it. As always, we welcome your feedback. Please feel free to reach out to me at bjacobs@bridgetowermedia.com.